The Food Regulation Policy Framework below is being trialled. View a full-sized image (JPG 202 KB) or download the image as a printable PDF (PDF 51 KB). 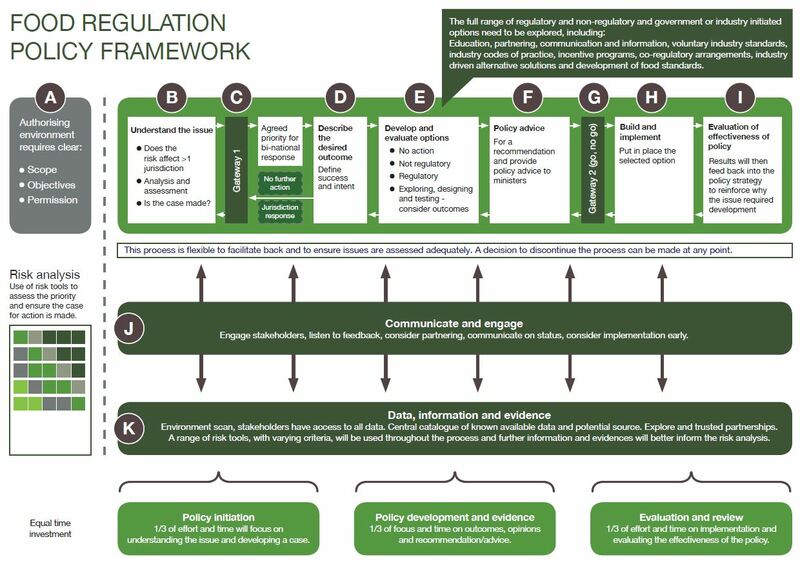 The Food Regulation Policy Framework (as shown in the flowchart above) is being trialled, and illustrates the steps followed by the Food Regulation Standing Committee (FRSC) working groups to identify and assess potential food issues. These steps help ensure the most appropriate policy response is applied. The Framework takes account of the nature and extent of the issue or risk posed, and considers different options for response, which may include non-intervention, self-regulation, co-regulation or regulation. Each of these steps outlined above are integral to delivering the best possible policy outcome. Please note that not all issues identified and discussed by FRSC will pass through the first gateway, and that the policy making process can be paused at any stage as more evidence is gathered and stakeholder consultation takes place. View detailed information about each step of the Framework.